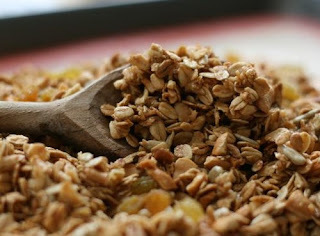 Here is a great healthy recipe for making your own granola. Granola is a fantastic cereal, but it's also a great whole grain snack. Mix in some dried fruit or raw chocolate nibs and keep a bowl on the counter for when the kids get the munchies. Much better than the chips or pretzels! Preheat oven to 225 degrees. Lightly oil a large baking dish or just line the dish with parchment paper. In a large mixing bowl combine the first six ingredients (oats through wheat germ) and stir well until mixed. Add the sweetener, oil and water and mix until well blended and crumbly. Pour mixture into baking pan, spread evenly, and put in oven. You have to stir the granola from time to time as it's baking. The granola is done when it is thoroughly dry and light brown in color. Add the almonds on the top of the granola when it is almost done. I make a double batch when I make this and freeze what I won't use in a freezer bag. To make a great snack, mix this with your favorite dried fruit, some raw chocolate nibs or chocolate chips, or add another nut. You've got your own trail mix. Karla, this granola sounds yummy!